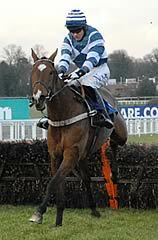 Overturn took advantage of the final-flight fall of Oscar Whisky to make all in the Coral Hurdle at Ascot. That left Jason Maguire to coast home on Overturn (5-2), with 27 lengths back to For Non Stop, who gratefully accepted second place. Maguire said: "He's a star. It's great for him to come down here. He's done it the hard way all the time on the Flat and over jumps. 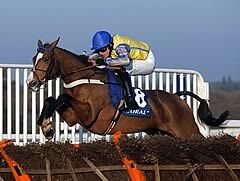 He was impressive at Perth when he won there and coming down here there was one horse to beat. "You'd think maybe a sharper track would be in his favour because he's won at Chester and in Galway. You'd think round here it may not work out, but he's so quick at his hurdles - long and short. Whenever a horse comes to him he picks up again. "I was waiting for Oscar Whisky. At the second-last I thought Barry (Geraghty) would be coming in a canter, but I could hear him give him a few cracks. "We had thought about going the Champion Hurdle route, but it was in our minds that he might like going a bit further on a stiff track so we are going to have to sit down and think about things."